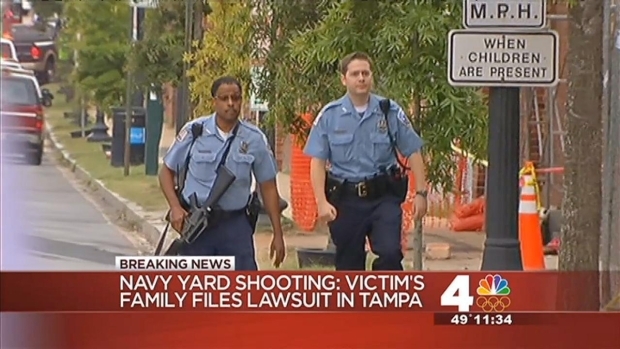 The family of a woman killed in the mass shooting at the Washington, D.C., Navy Yard has filed a lawsuit for more than $37 million against the U.S. Navy, the Department of Veterans Affairs and two government subcontractors. 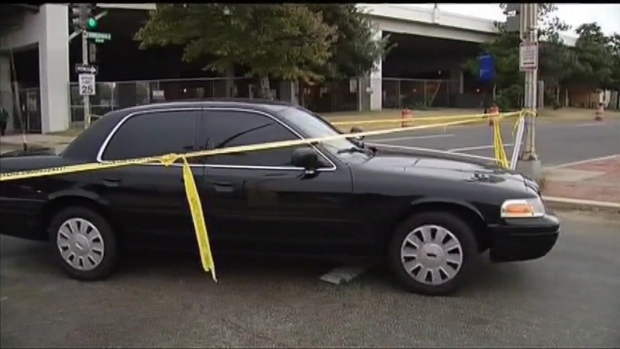 Mary Francis Knight, 51, was killed by civilian contractor Aaron Alexis on Sept. 16. Her family claims that the Navy's lax security allowed Alexis to enter Building 197 at the Navy Yard with a sawed off shotgun and a hundred rounds of ammunition without any metal detector screening. He opened fire, killing 12 and shooting three others. They're also suing the subcontractors for hiring Alexis, and the Department of Veterans Affairs for releasing him from a VA hospital where he was treated for psychological issues in Rhode Island. The family of a woman killed during a mass shooting at the Washington Navy Yard in September is seeking $37.5 million from the Navy and the Department of Veterans Affairs, saying that red flags about the deteriorating mental health of the killer were ignored. Alexis was a contractor with The Experts, subcontracted by Hewlett-Packard. Both companies are named in the suit. Less than six weeks before the shooting, The Experts withdrew Alexis' access to classified material for two days in August when mental health problems became evident, senior U.S. officials said. But the Experts restored his access quickly and never told the Navy about the incident, the officials said. Hewlett-Packard terminated its contract with The Experts shortly after the shooting. An administrative claim filed last month -- the first step in filing a lawsuit -- said the family is seeking $37.5 million. A court in Tampa, Fla., where Knight's family lives, is handling the case. Knight worked as a civilian employee in information technology at the Navy Yard. She lived in Virginia and commuted to D.C. for about five years, and had also worked as an adjunct professor at a community college in Northern Virginia. She was the mother of two daughters. It's been two months since a gunman shot and killed 12 people inside Building 197 at the Washington Navy Yard. Eight other people were injured -- including D.C. police officer Scott Williams. News4's Darcy Spencer spoke with officers and friends who are raising money to help Williams in his recovery. "She was a great patriot who loved her country and loved serving the U.S.A.," a family spokesperson told News4 shortly after her death.